The Nikon D850 DSLR camera ($3,296.95 at Amazon, B&H, Adorama) has two memory card slots: one XQD card slot and one SD card slot (supports UHS-II SD cards). And the Nikon D850 comes with 45.7MP FX-Format Sensor, 4K UHD Video, 7fps burst and 8K time-lapse. As we all know, every second matters in photography, so a fast enough memory card is a must for serious photographers. So, buying a fast card is always worth it: Fast write speed provides fast buffer clearing time between burst shots optimizing your shooting experience. Fast read speed can let large files such as 4K video or a bunch of high-resolution images by continuous shooting transfer to PC in seconds. Reminder: if you plan to shoot videos, stick to 64GB (or larger) cards for the best video codex. 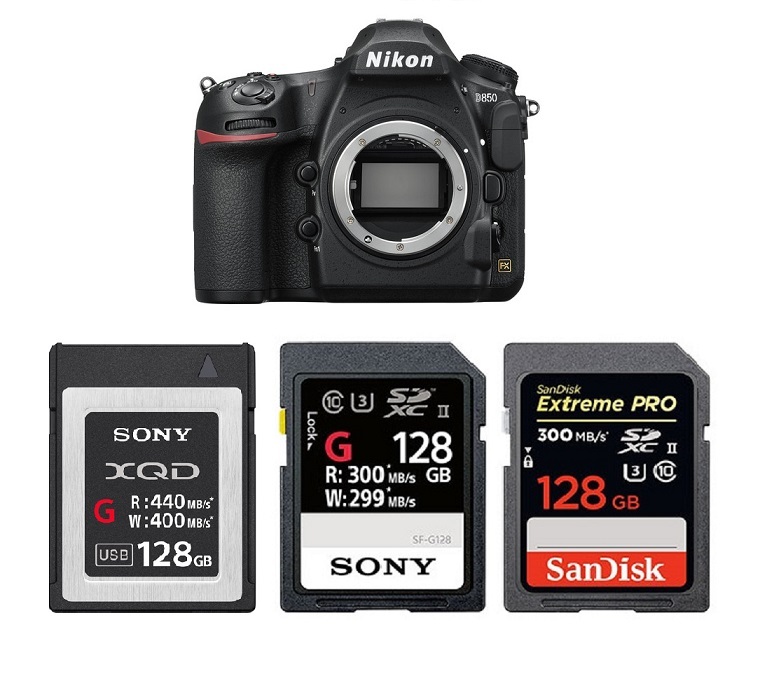 Here is our list of top recommended XQD Cards & UHS-II SD Memory Cards for Nikon D850 DSLR camera. The Nikon D850 card slot 1 supports XQD card. We know the XQD cards are much faster than SD cards, so if you shoot 4K video with Nikon D850, you may need a XQD card. Currently, the XQD cards on the market are from Sony – the affordable Lexar 2933x XQD 2.0 memory card is now discontinued. So, the Sony XQD G series cards will be the best choice. The Card Slot 2 is compatible with UHS-II SD memory cards. The Sony SF-G UHS-II Cards will be the best choice: currently they are the world’s fastest SD memory cards boasting an ultra-fast maximum read speeds of up to 300 MB/s and maximum write speeds of up to 299 MB/s. The SanDisk Extreme PRO UHS-II SDXC and Lexar Professional 2000x are also excellent choices and two of the best selling sd cards. In addition, the Hoodman Steel 2000x SDXC UHS-II and Delkin Devices Cinema SDXC UHS-II are great UHS-II memory cards with fast Read Speed & Write Speed.